Question 4: What are your thoughts regarding the highly successful My Water, My Watershed program that is an experiential science-based educational program for fourth and fifth grade Santa Fe Public School students? I have not seen the curriculum for the program. As an educator, I would like to see the program tied in a meaningful way to a teaching unit that lasts longer than the 1-hour pre- and post- visitations and the full day field trip. I know the logistic are challenging, but I think 2 half-day trips could be more effective. I support and would encourage its expansion. I believe this program is significant and should be expanded to reach more of the public school age students. With the importance of STEM in our education, we have to engage students early and keep them engaged. Hands-on learning is the best way to engage a child. However, science is not the only thing our children are learning in a program like this. They are also learning stewardship and how important it is to take care of our rivers and the life that rivers create. It is an amazing program! Santa Fe is lucky to have such program. Not only has it been in the schools but in the City of Santa Fe Summer Youth Program. It is not only educational but a once in a lifetime experience for the youth to explore such an amazing environment. There should be more hands on educational components for the youth in the schools such as this one. My daughters have had the opportunity to experience this program and they couldn’t stop talking about it. The City of Santa Fe, the Santa Fe Watershed Association, and Santa Fe Public Schools have done a great job educating kids about our water system. The program should be expanded to all fourth- and fifth-grade students in the district. I think it should also provide a little history about one of the world’s most important environmentalists and protector of wildlands (like the upper watershed). This man proposed to his wife outside what is now the Georgia O’Keefe Museum, and started his family in the Rio Grande Valley between Tres Peidras and Albuquerque. His name, of course, is Aldo Leopold. I am a Santa Fean born and raised. We live in a high-desert, alpine region that has diverse natural beauty and natural resources. I know from my own childhood how important it is to give students experiences outside, in the wild, so that they learn to appreciate life, the science of the natural world, and the scarcity and preciousness of our mountain water. 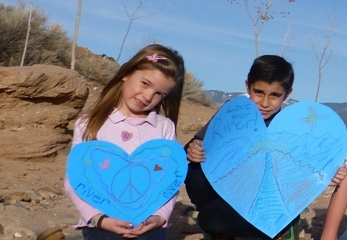 The My Water, My Watershed program is valuable not only because it offers this experience to children who otherwise might not have it, but also because it enables children to reflect about their own responsibilities to conservation as citizens of Santa Fe.